Driving car to work in morning I don’t smell anything. After being parked all day I smell gas shortly after heading home. I only drive it once a week. Just replaced all the fuel lines under hood and no difference. I can’t smell anything when I sniff around under hood. Smell is only present if I have vent fan on. If I turn off there’s no gas smell. About the only fuel lines I’ve not replaced are the ones above gas tank. Fuel pressure normal and I don’t really notice any difference in bleed down between the 2 pumps. Any suggestions how to locate the source? 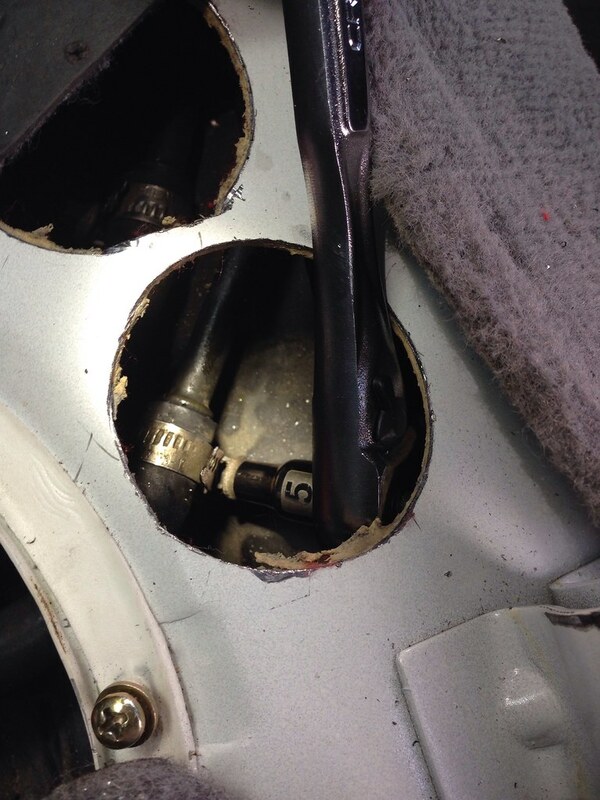 update: After tightening a few hose clamps on gas lines at rear of engine the problem seems to be resolved. One in particular was not very tight. Last edited by BMSman; 10-04-2018 at 12:14 AM. Could be a bad clamp on the one's near the firewall, Could also be a clamp or hose on the fuel filters, Best to find it and not drive it. Usually there's a white run on the rubber lines where the leak occurs, Finding them in the auctions burnt use to be very common before the DIy fixes here and RF got popular. 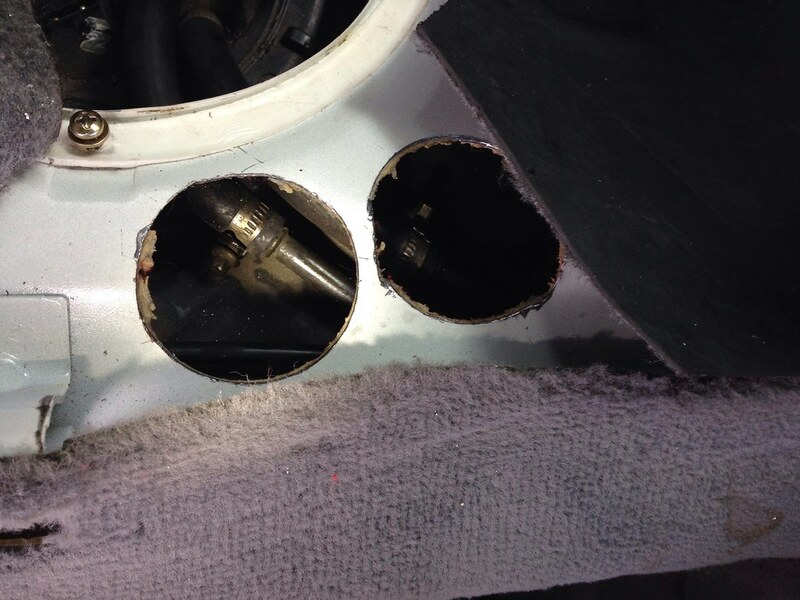 Also check your canister and fuel pressure regulators for dampness. Is the gas smell strictly inside the car or present near the filters as well? 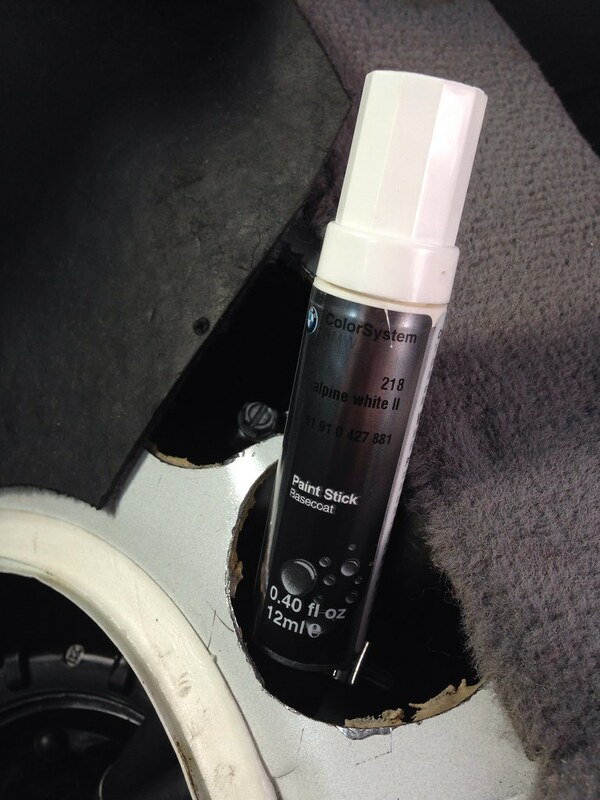 If you've checked the hoses in between the filters for any leaks, the next thing would be to inspect the fuel pump and fuel tank sender seals under the rear seats. Also, the fuel tank vent valve may not be functioning correctly and you may have an overpressurized tank, causing bleedoff through the fuel pump seals into the cabin...That last one might be a stretch of the imagination but not an impossibility. Last edited by mjrgroup; 09-20-2018 at 04:45 AM. Be very careful with the gas smell. We had a fellow board member that ended up being able to roast marshmellows over his 8 (he was the original owner), and it burnt to a total loss from a leak from the lines leading to the gas tank. Check and change the fuel lines at the left rear (driver's side) of the engine. They can be a pain to change, but much better than a toasted 8. 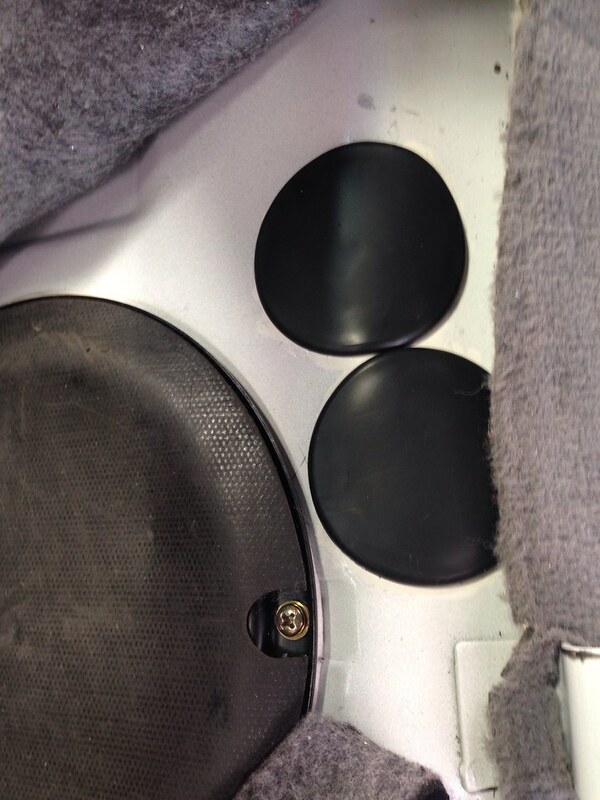 Also check the lines on the tank, which are located under the right rear seat under the circular cover. had that last year leaking there when I installed new fuel pumps and the new ones with real good pressure and flow showed me where the leaks were. Did not leak with the old almost 30 years old fuel pumps. Here is what I found when chasing a slight fuel seepage on my CSi recently. 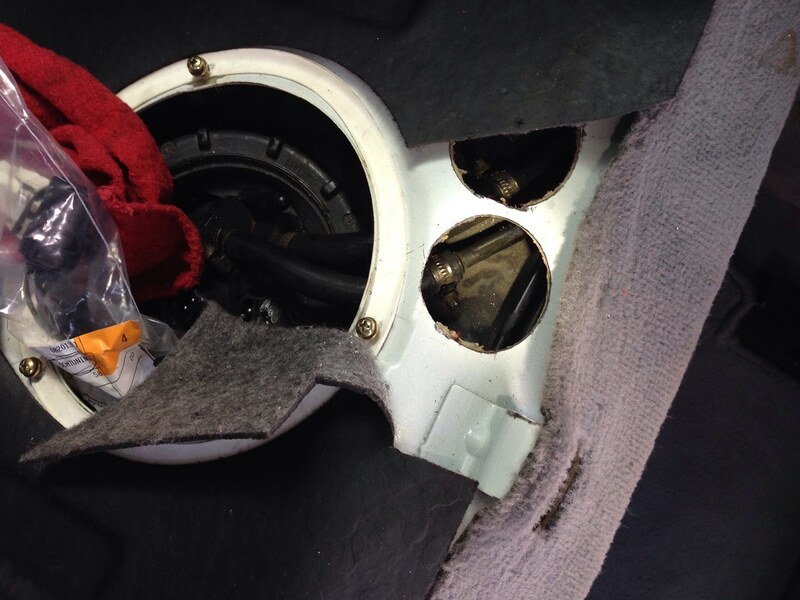 The bottom of the fuel tank under car was damp with fuel, and there was a fuel smell in the cabin. Fuel was weeping back along one of the pump hoses (shown) and was pooling in the tank/sender unit housing before spilling over onto the tank itself, then flowing down the tank to the bottom where it was visible from underneath the car. Fortunately the two factory fuel pump/sender unit hoses on my car (March 1994 build) were installed with neat hex-drive hose clamps, so I didn't have to cut any holes in the floor to access the two forward clamps! All four hose clamps were somewhat loose, with the two (concealed) forward clamps requiring about 1-1/2 turns each using a tiny ignition spanner/wrench to fully tighten them again. The two aft clamps took about a half-turn each. Both rubber hoses were still in good condition. Some damage is evident on the pump locking ring, from installation ex-factory. I could tell this was the original pump installation, as I had to cut out the factory sound-deadening material to get access to the cover plate. Getting to the hose clamps will be a challenge. I, and many others on the forum, drilled holes in the frame to get permanent access. Then painted the metal and put rubber gaskets to protect them. See pics below. Last edited by mjrgroup; 09-21-2018 at 03:58 AM. That's a really tidy solution! I like it. Where did you get the rubber grommets? Yes a good looking solution. Luckily I didn't need to replace my hoses, so no need to cut any holes in my car. Thanks to BMW's factory orientation of the two forward hose clamps, I could reach them both and tighten using the aforementioned ignition spanner. Hey Roger a bit off topic but I saw an old post of yours while looking up import information about a CSI. Your post was about the b12 being able to come stateside thanks to you and Bill Fox. I assume that is also the case for other e31’s including the CSI? I found is a 96 in Germany and want to bring it to Fort Lauderdale as a gift for my dad who to this day still pines for the car. If you have a link to a thread where you’ve gone over what you had to do for importation headlights, reflectors, epa etc and if they make a fuss about the AHK. Any information you could give me here or in a message would also be greatly appreciated! Thank you! I would also like to know as I JUST had to tighen these damn clamps after new fuel pump carrier install and it took sooo much contortion on my body to finagle a pair of long needle nose pliers under the metal opening and will probably want to tighten them again a bit more for peace of mind but yes a hole drilled out would be KEY. This type of wrench does the trick (forget the size I used) - no need for pliers, or cutting holes in the car unless the clamps have been rotated out of reach. Getting at them still requires a degree of contortionism though. 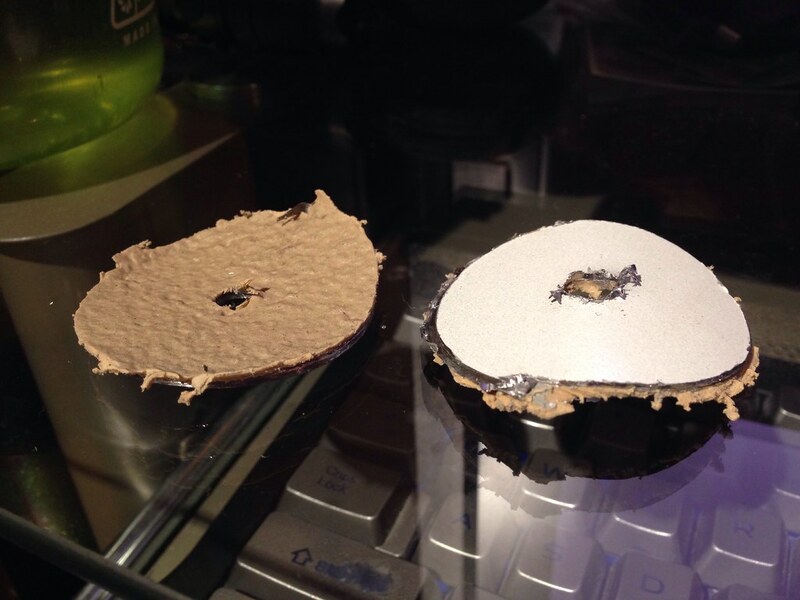 Those are generic rubber grommets that can be sourced from anywhere (Digikey, Mauser, etc.) 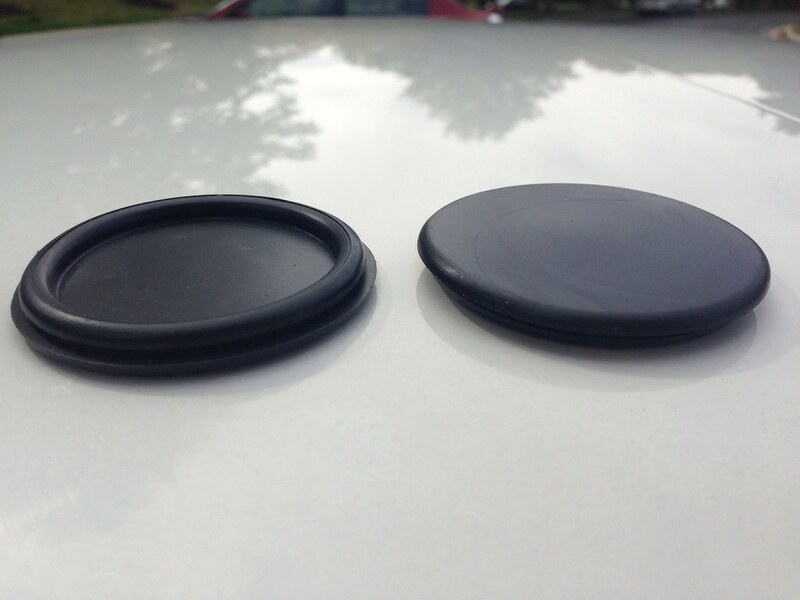 In the automotive industry they're typically called just "blank firewall grommets" and can be bought in a variety of sizes. I ordered the grommets off eBay in a very specific size, and then matched a holesaw to the size of the grommets, ensuring that I would have a perfect fit. Good to see you are still around. Any new stuff happening to your car? I just drilled two 2" holes and painted the edges of new holes. So nice/necessary for access. Checked hose clamps. A little loose but not much. Waiting for rubber grommet blanking parts to be installed. This should have been designed like this from factory!! Last edited by clockwork; 11-03-2018 at 09:31 PM. Help: Gas smell inside car!